Anyway, looks like Cave Story+ is also getting a retail release in Japan. Think that's the first indie game to get one in that region. Nice, though I would liked all three in one package for the PS4. Not even an extra point for ARMS but Splatoon 2 gained 21 points. I guess the ARMS direct helped only Splatoon with Comg at least. I really hope the test fire / test punch helps iARMS out in Japan too. ARMS seems to be doing better in the west in general while Splatoon 2 isn't even in sight being a another month away. I don't think we can possibly call that yet. Hot take of the month? Hot take of every month? Nintendo didn't give W101 a tenth of the attention they're giving ARMS. I think ARMS has a good chance of being a low-1 million selling game, like the first Splatoon, but I think it'll slow burn it's way there. I mean it's currently the 3rd highest selling game on Amazon.com and it's been in that ball park for a while now. The only games above it and Nintendo games that have already released so I doubt Nintendo is sweating bullets or anything. Probably won't be as popular as Splatoon is in Japan though which shouldn't be Great surprise. I believe it will be the post game content that really drives sales. For a new ip yeah. I mean it's what drove Splatoo's sales. I feel like the only real major omission is costumes . The alts are nice but people realy, really seems to like costumes in multiplayer games. ARMs is still a fighting game at the end of the day. The ceiling is a lot lower than for a shooter. If it hypothetically sold 200k in Japan it would still be quite successful for its genre. I just don't see a fighting game like this having a huge tail like Splatoon did. It will have better legs than a normal one due to it being a Nintendo game, but other than that I think a lot of people are going to be severely let down if they expect a million seller. The same can pretty much be said of Smash Bros and fighting game. I don't have the numbers but haven't shooters in general been more successful even in Japan? Yes it easily outsold his predecessor and the remake of the first one. I hope AtlusUSA will localize it. Smash brothers is old very old, Japan still has a fighting game arcade scene and several well known household franchises. The same has never been true of shooters until now. There have been successful Third Person Shooters in Japan. Yeah bu they don't need it to do has aswell as Splatoon did in Japan. If they can make up the sales worldwide they be just happy since globallly appealing franchises are what nintendo needs the most now. Of course but they weren't in the same height as fighters at their peak and even Smash brother remains popular currently in Japan. Which is why saying the ceiling isn't as high rings hollow to me. I'm seeing ARMS doing well because of a few factors. - It's an arena fighter like Gundam VS or Dissidia. From what I've seen, these tend to be more popular than traditional fighting games. - The art direction and general packaging of ARMS is quite charming. I don't know if it's Splatoon-levels of charming yet, but it's appealing. - It's got that huge marketing push from Nintendo. - It's on a system that people are hungry for, unlike Pokken, which was hobble by the Wii U. - It's got that Splatoon-style GaaS content drip feed that should at least guarantee a long enough tail. I will agree that ARMS' actual appeal has a lot of question marks behind it. It's also a new IP, so there's that danger as well. But I'll be optimistic. Good chance of low-1 million sales, with higher chance of landing in the 500k-1 million ball park. I totally disagree. If it only sold 200k in Japan. I would consider it a failure. THis is a game made by Mario Kart team there. Doing just 200k is nothing less than failure and that is without considering the opportunity cost they miss there. Expectations of ARMS doing anywhere close to a million are pretty crazy to me. If the game does 500k it's a success. There is no reason currently to believe it's going to cross the 1 million threshold or even get close if it has a long tail we will need to see how strong it is. Fanarts are too strong, even I wanna do some lewd one. Could you back this up with some numbers? The shooters I have in mind Earth Defense Force 2025 and the modern Resident Evil series (5 and 6, in particular). You don't seem to be talking about exceptional fighting games, so I have to imagine games like these would meet the criteria of being "major and substantial" in "decades" (so, never? There's only like 3 decades to choose from). My very loose understanding of the genre is that people really into them in Japan prefer to play them in the arcades and the console releases don't do as hot. Bic Camera, as every week, has a lottery on Saturday. 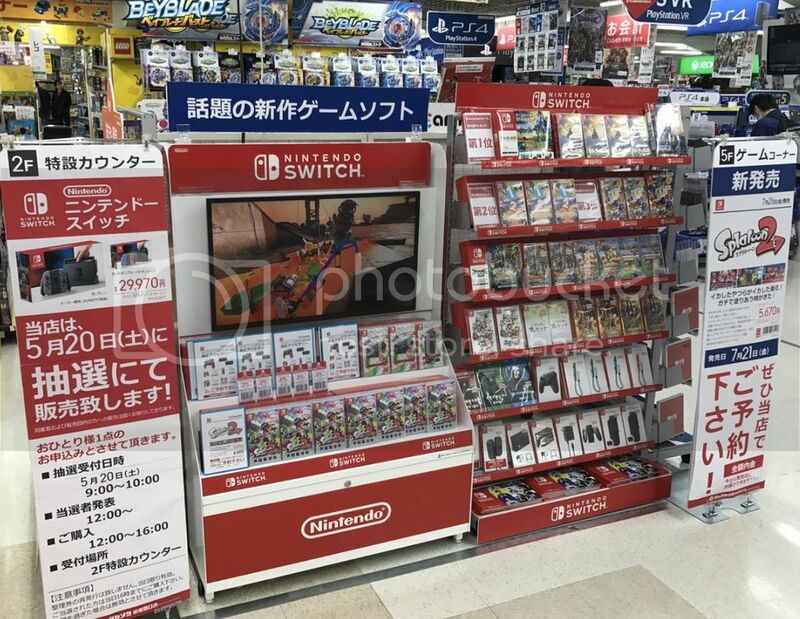 The usual Switch stock site also said that Nojima's stores had a new shipment today, but as always is already sold out. Here's to hoping, it looks like a big improvement over DT2. Here in an instant. Gone in a flash. I don't know if it is me having such high expectation considering the pedigree of the team who develop the game but i also believed that Nintendo would not consider doing 500k or lower than is successful as they would rather just make the team develop other type of games which can sold more rather than ARMS. I think instead of comparing ARMS preorder numbers to Splatoon 2, it'd be more helpful to compare with Splatoon 1. Also, before and after the Testfire. The Testpunch is still coming up. Shooter vs. fighting game are also less helpful categories than kyôtô (fighting together, which is also the term to refer to hunting games in Japan) and kakutô (fighting). Splatoon isn't a hunting game but it shares the group dynamics: 4 people fight together, and win or lose together. In fighting games, 1 fights 1, one loses, one wins. I guess the 2 vs. 2 mode helps, but Splatoon would be more appealing for that reason, even though ARMS has similar modern, colorful and cool aesthetics. Still, like Splatoon 1, ARMS should have legs. The local multiplayer will ensure that. And Splatoon 2 will sell ARMS: People who meet to play Splatoon can try ARMS if even one among them has bought it. This is classical word of mouth, showing off your portable game to friends. That has sold new Nintendo quality IPs in the past. It's a Japanese sales thread I know but Japan isn't the only place they are going to sell the game. It would be like saying Zelda team should develop something else because Zelda doesn't scratch 1 million in Japan. Even then you are still over estimating. List the amount of new IPs that break 1 million on game 1. It's a small list. It's the internet. ARMS is either going to be the next huge IP or a complete dud. Shh.. your logic and reason has no power here. Don't forget ARMS doesn't use only traditional controls so it is rather more accessible for people, that is a factor to consider if it has appeal. Other than that, not long until BitSummit starts. That's why I wanted to ask for a comparison of preorders for ARMS with Splatoon because of the Global Testpunch coming up. That's the answer of question I gonna ask. But it didn't features enough tentacles so I doubt about success rate and legs. I feel like ARMS will be a title that will be a lot more successful in the West than in Japan. I say this because ARMS has that Pixar quality designs to it which is really popular in the West. Although are Pixar Movies popular in Japan? Anyway things can change though with the Testpunch coming soon. The concern is more about broad appeal. One of the appeals of Street Fighter 2 was that it had characters from different countries so that it could appeal to a lot of people. So the point I am getting at is that one important thing about broad appeal in a fighting game is the character roster. When a person starts out a fighting game they will want to choose who they like. With Smash Bros for example there is a huge roster of Nintendo characters that a lot of people like, it's a game that easily appeals to them. With ARMS however, it's got more of a hill to climb. That's why it has the global testpunch so that people can try out the game. Unfortunately, it's been pointed out not all the characters will be available in the testpunch: No Twintelle, Kid Cobra, Barq and Byte. ARMS is definitely a game that will heavily depend on word of mouth, could make the difference between midly successful title and a hit, in my opinion. With Nintendo planning to keep supporting the game with post-launch updates, good word of mouth would ensure strong and steady sales in the long run, like what happened with Splatoon. We'll see what kind of impact the demo will have. I've heard nothing but praise from people who got to try out ARMS at various events, so looks like all Nintendo needs is a match to light it all up. Are there non-super-niche fighting games that don't sell 80%+ of their units overseas? Basically i'm talking about their hey day or prime when referrig to particular genre's absolute ceiling in Japan. e.g Tekken 2 selling 1 million on the PS1 in Japan, Tekken 3 1.4 million, Street fighter II at 2.8 million for the Snes etc. Not talking about their usual sales which have seen a substantal decline but what the absolute max a breakout success can do since Splatoon was a total breakout in terms of 3rd person shooters ofr Japan. Not since the PS1, no.